This is the first record to come out under my own name. And it had my picture on the cover. That was in 1965, back in the days when the record company was under the impression that a picture of me might be good for sales. Most of it was done in a little demo studio not far from Les Cousins in Soho. Someone had the keys to the place and a bunch of us went across and played for fun after the pubs closed. The material is fairly typical of the time -- so-called British Folk Blues, direct from the Dorking Delta, plus some guitar tunes of mine -- the sort of thing I had been making up since I first had a guitar. Bert Jansch was among those present, if not correct , and the two tunes with both of us probably represent the earliest in the Bert- and-John 'Folk Baroque' department. First of many in the 'made-up-on-the-spot-and-never-to-be-repeated' tradition. 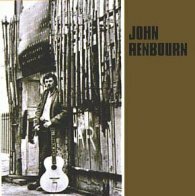 John Renbourn's first solo album. Quiet rare to find a copy in good condition these days. I have seen it listed for £30 with some second hand records dealers. Bert Jansch plays second guitar on two of the tracks weaving his magic as per usual. There is a great version of a traditional song "Winter is Gone" which Nick Drake covered on the Bootleg "Tanworth in Arden 67/68" The rest of the tracks you'll see Renbourn in full effect. A must have for any Renbourn fan. It has been reissued with the album "Another Monday" with bonus tracks from Castle Communications. One of John's first instrumentals. The members of Pentangle have a strange definition of 'traditional' - this is a Blind Boy Fuller song that John learned in Paris from an American girl. A poem by John Donne set to a finger-style guitar accompaniment. This time it does seem to be 'traditional' - even my Josh White and Leadbelly album lists it this way. Famous Train Tune by Renbourn. Another traditional tune, this time by the Reverend Gary Davis. An instumental dedicated to Hogsnort Rupert. Apparently John once played in his band - The Famous Porkestra. National Seven is a road in France from Paris to the south. A bottleneck version of the spiritual.